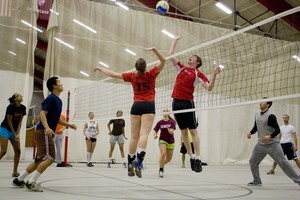 Intramurals are an important part of the fabric of the University of Chicago community. Numerous student athletes go unrecognized each year just because they have chosen to play intramurals instead of going for the glory of varsity sports. No longer will these hardworking competitors go unnoticed in the annals of Chicago sports lore. Intramurals are a way for us to showcase our talents against other players of a similar skill level. Whether it is a familiar sport such as football, softball, or basketball, or a more obscure sport like broomball, inner tube water polo, or even euchre, there will be Chicago students who want to compete. But just because the talent on the field might not match that of a varsity game doesn’t mean that the competitiveness isn’t up to par. 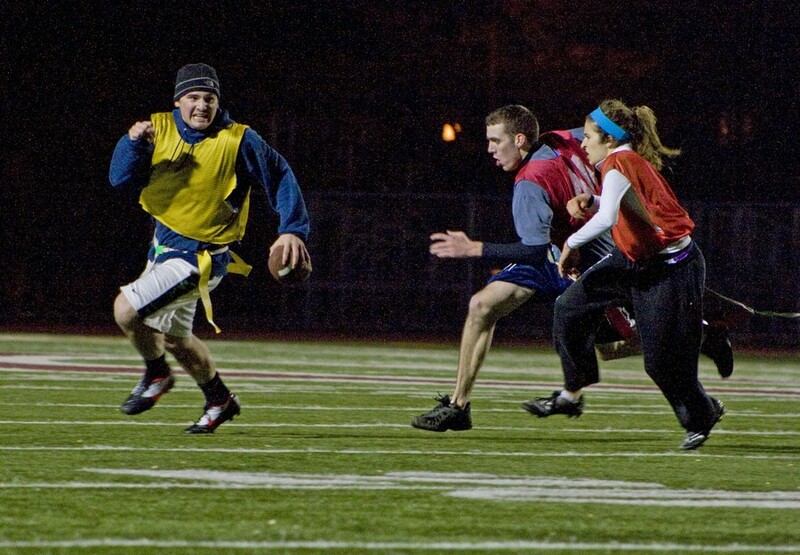 Oftentimes, intramural matches will feature noticeable tension between players of opposing teams as pride, ego, and talent do battle on the field. Needless to say, when house or frat glory is on the line, players will be motivated to win. At long last, let us be the first to introduce you to the quarterly intramural Blowout Issue. Alper House Red Army’s five-year winning streak was shattered yesterday afternoon in a 32–13 upset by the Tufts House Men in the undergraduate resident men’s intramural flag football championship at Stagg Field. Both teams started aggressively, with Alper scoring early on but missing the extra point, allowing Tufts to set the score 7–6. Due to good coverage, Tufts maintained a 13–6 lead against Alper throughout the first half. The second half began with a solid kick return by Tufts but proved difficult for the Red Army, who gained little yardage from running the ball, their primary offensive tactic. After letting up three touchdowns to second-year “Goggles” John Zackrison, the Red Army seemed demoralized, and despite a final touchdown by Alper first-year Andrew VanWazer, the slight recovery was not enough to turn the game around. “Tufts House is really good. They deserved to win. They had many good plays and some really fast athletes,” VanWazer said. Fourth-year Mike Kenstowicz commended his team members on their long-awaited victory. “This is the most inspiring win in my four years in Tufts House. We’ve lost to these guys for four straight years. There’s nothing better than going out on top,” Kenstowicz said. Stakes were high, tempers were hot, and the weather was chilly on Stagg Field for the Coed Residents Flag Football Championship last night. May House narrowly defeated Wick House 34–33, weathering a last -minute charge from the underdogs before securing the championship. May and Wick exchanged touchdowns throughout the first half, with each team scoring on every drive. The two teams went into halftime tied at 21 and searching for answers on defense against each other’s high-flying offense. After trading defensive stops for the first four drives of what was shaping up to be a defensive second half, Wick struck with the first points on a long touchdown pass, but failed to convert the extra point. May retaliated with its fourth touchdown pass of the evening and, with two minutes left in the game, recovered a kickoff, giving it a chance to add to its slim one-point lead. 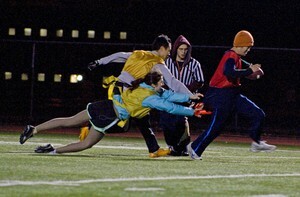 With possession of the ball, May ran a fake quarterback sneak and found the wide receiver left alone in the end zone. May easily connected on the play to push its lead to seven. With one last chance to tie or win the game, Wick drove downfield and scored with a clutch touchdown through the air. The team again failed to convert on the extra point, though, which ultimately proved to be their undoing. May’s quarterback took a knee to retire the remaining time on the clock and seal the championship. Violence Solves Everything (VSE) won the Men’s Undergraduate Independent Flag Football Championship on Sunday against Nasty White Athletes (NWA) by a score of 27–12. VSE was comprised mostly of former and current baseball players, while NWA was representing Phi Gamma Delta (Fiji) , an on-campus fraternity. Fourth-year Rodney Nelson was the captain of VSE, while second-year Mike Ember served as the captain of NWA. 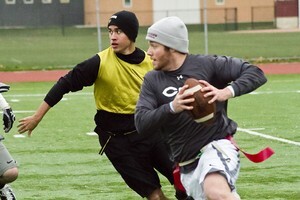 Despite losing in the title game, NWA had a successful IM season, defeating Sig Ep and CMAC in regular season play. The team’s strong showing was novel, due to its lack of preparation noted by some team members. “The Fiji flag football team did not have a single offensive play all season, we were basically winging it,” said fourth-year Justin Williams. The MVP for NWA was fourth-year Joe Patton, who scored the team’s two touchdowns and had a pick on defense. “[Patton] was really the only one that played a good game,” Williams said. Williams and other team members also credited their loss to a poor mental state. “A lot of varsity football players came to support us, and I think they just psyched us out,” said Williams. NWA still wants the last word: “Just wait till IM basketball season,” said Williams. Cinderella will have one last chance to dance. Maclean house, ranked 8th going into the playoffs, will have a shot at glory tonight as they take on the Pug Thugs (Stony Island) at Henry Crown. Maclean has had a treacherous road to this final game, first taking down Goliath-killer Thompson house in the quarterfinals, only two days after Thompson defeated the first-ranked team in the bracket, the Jannotta Mythdragons. The team then dominated the traditionally powerful Red Army (Alper House) in the semifinals, winning both games in quick fashion, 21–10, 21–12. On the other side of the court will be the heavy favorites, the Pug Thugs. Led by captain Adil Tobaa, the Pug Thugs had not dropped a single game all year until yesterday’s semi-final, losing their first game to Halperin House. The Thugs rallied to win the match, winning the next two games 21–12 and 15–10. According to Tobaa, the goal of each game is the same. “We’re going to have fun tomorrow, that’s why we’re here, and that’s not going to change,” he said. Win or lose, the end goal is still the same.